In a bowl, mix cornflour, plain flour,ginger-garlic paste, chilli powder, salt and little water to a thick paste. Add sliced mushrooms and marinate it for 15 minutes and then fry it in the oil till crispy and golden brown. Keep it aside. Heat 1 tbsp oil in a pan and add finely chopped garlic and 1 tbsp white part of spring onions and saute for a minute. Add finely chopped onions and saute until slightly browned. Add chopped capsicum and spring onions and saute for 2 minutes. Then add soy sauce and mix well. Reduce the flame and add green chilli sauce, tomato sauce and salt and mix well. Add 1/2 tsp cornflour mixed with 2 tbsp water and bring to a boil. Add fried mushrooms and pepper powder and stir well for 1-2 minutes for the sauce to coat well. 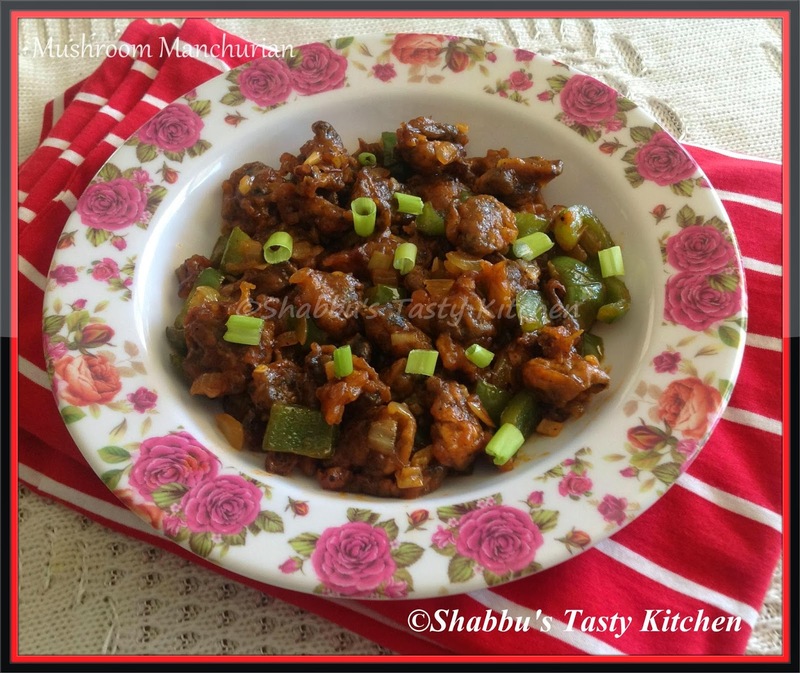 Delicious mushroom Manchurian. So tasty and inviting. Looking so tasty manchurian !! Manchurian looks awesome.I am sure ur kids must be really happy to have it. Yum yum,looks fabulous,will surely try this.